Rumors are stealth infodump delivery tools. They use concision and diegesis (that is, presence in the fiction of the game world) to disguise their load-bearing capacity. They are a wonderful way to present setting detail and hooks without overburdening either the referee or the players. I don’t use them nearly enough. However, as traditionally presented, they also have a potential problem: false or incomplete rumors are hazards, and like any game hazard, should come with clues to support fair play. Personally, I prefer incomplete rumors to false rumors. Incomplete rumors preserve the sense of a living world while maintaining player trust. Here are some methods to build false or incomplete rumors that add to the play experience. Provide contradictory rumors together. As all of them can’t be true, this signals to observant players that more investigation is required to actually ascertain risk. This has the added benefit of promoting further information gathering. Make it clear to the player that the rumor is false, but make that falsity interesting (why is the NPC lying, is she being manipulated by some other creature or force?). This is much like making a trap obvious, but still dangerous. Have the false rumor contradict some previously established setting detail. This is a more subtle form of option 1. Be careful with this approach though, as it is likely to be missed by all but the most engaged players (and consider the three clue rule). Provide a rumor about concrete conditions but don’t include motivations (or the inverse, provide a rumor about motivations but don’t include any concrete conditions). Example: a wizard is trying to find a cure for a wasting disease, and is abducting villagers to experiment on. Rumor one is info about the wasting disease, rumor two is info about lost villagers returning as ghouls. This post was prompted by Wayne’s recent Bree-Yark Factor article. Additionally, I would suggest taking a look at FrDave’s concerns about false rumors (with which I mostly agree), and Telecanter’s post about rumors. This entry was posted in Uncategorized on September 9, 2013 by Necropraxis. I am really fond of false rumors – but I have never considered them hazards before. Of course they are hazards. This has prompted me to look at rumors I have provided, and rumor list I have enjoyed and I come to similar conclusions as you. However, I don’t think false rumors are as bad as all that, and while I like your system for false rumor mongering I think there is still a place for patently false rumors. False rumors are like traps, and like traps one of the main thing that matters to me is that the false rumor makes organic sense. A trap works when it fits with a location both in placement and mechanism, so that when a player triggers it the response is “Of course, how did I miss that”. Bandit lairs shouldn’t have lots of cursed altars to forgotten gods scattered about, and evil temples shouldn’t depend on crude logs that swing from the ceiling when one goes down a unused side passage. Likewise false rumors are best when it makes sense how they are derived. For example in the B1 rumors I rather like “All entrances to the caves are trapped” because the entrance to the kobold cave (the easiest cave to approach is certainly trapped. I can see a this rumor getting started from an aborted attempt to plunder that cave. what was “Errol the Black was killed by a trap before we even got inside so we left” becomes “Everything up there is trapped”. Another issue is the player skill that false rumors test – credulity. Players and PCs should beware the untrustworthy narrator. Why do barflies know about surrendering goblins? If you put the “Bree Yark” rumor in the mouth of “a scarred veteran of the goblin wars” that’s a gotcha sort of trick, but if it’s said by a random town tough it begs the question “What does Axhandle Billy know about goblins?” False Rumors also test player ability to respond to the unexpected. 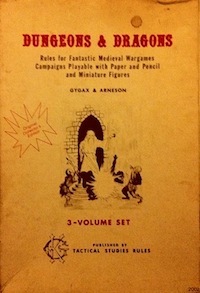 In my first D&D game I remember thinking how unfair it was that after our party shouted “Bree Yark” at them the goblins in B1 kept attacking, yet really, should a player plan depend on a single course of action and positive response to a rumor? Rumors that lead specifically to death are a different story of course “The blue fountain is poison and the red heals” is awful if the red fountain is poison, because it makes no in game sense and it’s specifically aimed to trick the players. I dig your methods very much for I find the existence of false rumours making me uninterested in listening to any rumour in the first place as a player.